Memorable moments with food--collected by "one of the best of the young food writers" (Jeffrey Steingarten, Vogue food critic). New York Times Magazine food editor Amanda Hesser has showcased the food-inspired recollections of some of America's leading writers - playwrights, screenwriters, novelists, poets, journalists--in the magazine. 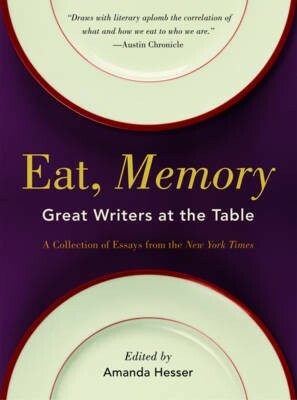 Eat, Memory collects the twenty-six best stories and recipes to accompany them. Ann Patchett confronts her stubbornness in a heated argument she once had with her then-boyfriend, now husband, over dinner at the famed Paris restaurant Taillevent. Tom Perrotta explains how his long list of food aversions almost landed him in an East German prison. Gabrielle Hamilton finds that hiring a blind cook leads her into ethical terrain she wasn't prepared to navigate. And poet Billy Collins muses over his relationship with a fish he once ate. Also included are stories by Chang-rae Lee, Patricia Marx, John Burnham Schwartz, George Saunders, Colson Whitehead, Kiran Desai, Pico Iyer, and Heidi Julavits, among others.